I STILL have not gotten all the gremlins from my email system.. Hope to resolve everything shortly. That may soon mean switching to an entirely new program such as Constant Contact.. Opening The Reservation Book Up For One Sea Bass Trip. Weather Looks Bad Through Early December Save Monday, Nov 28th. Will watch weather closely for more trips in Dec..
Been some fine fishing since my last report. Most trips about half the clients are limited on sea bass. On one trip everyone bagged out. Water's certainly cooling. Have begun to see the dreaded spiny dogfish even though I've not yet witnessed huge chopper blues that can destroy a days's fishing. Usually dogfish follow after choppers. Dogs are not welcome guests..
Was seeing more false albacore than I have ever seen in fall, surely a spike in population; but have not seen bluefins as we usually would by now. I had bluefish for dinner quite a few times of late. I enjoy these 1 to 3 pounders. I think their bad reputation comes from bad handling. Bled & then iced well, they fillet nicely and cook-up sweet. (either trim or leave the lateral line, the blood line, on the plate - exactly as anyone would with tuna.) I often use Uncle Jessie's Potlatch seasoning for about anything - works for blues too. On the gourmet side, I recently tried piccata sauce (it Googles) on pan-seared bluefish. May have been the best fish I ever enjoyed. Certainly too, Uncle John's recipe of simply a bit of fresh salsa atop some fillets & then baked is really tasty. I think of fall migrations as moving "up & down the coast" with the nearshore pelagics. Bluefish, stripers, sea trout (weakfish) - these seem to generally follow the shoreline. Scup, summer flounder (fluke,) & sea bass, however, just head for the deep. Might happen fast if waters cool especially quickly; might happen slow. As with any broad generalization though, the truth can be somewhat more diffuse. I have had reports from scallopers in mid-winter catching weakfish in 40 fathoms--big weakies--and those fish from straight off, not down toward Carolina. We also saw, with the 16,000 tag federal sea bass project of 2002/2003 (and then a few 'archival' tags in following years--electronic tags that reveal day-to-day activities by recording depth, temp, & salinity.. http://sedarweb.org/docs/wsupp/SEDAR25-RD14%20Moser%20and%20Shepherd%202009.pdf ) The 16,000 belly tags, while offering a wonderful retention rate, and clearly showing what I and others before had seen in habitat fidelity; the belly tags were useless for determining release mortality associated with barotrauma. (see 5.1 https://en.wikipedia.org/wiki/Barotrauma ) When the surgical cut was made to implant the tag, it degassed the fish - as if it had been 'vented'..
Gut-hooked, or heart wounding because it's so near where the gills join; snagging them in odd places; this is hook-mortality & is combated with circle hooks, or kahle/wide-gap hooks which have identical performance to circles with fish I've studied. I like 8/0 thin wire circles in late fall & use 4/0 or 5/0 kahle/wide gap hooks for sea bass year round. I could probably count the deep-hooked sea bass on my boat on one hand, but I can't think of any. We do see some deeply hooked sea bass & flounder, they're just quite good sized. Larger; their big mouth gets them in trouble, thankfully making we humans less unique in the animal world. This "estimated recreational discard mortality" is but one small piece of an overall, "how many fish are in the sea" calculation from which our quotas are set. It's well and truly scientific, but here science is allowed, (or these scientists allow themselves,) great leeway in accuracy owing to the near impossibility of knowing - really knowing - how many of any one species is out there.. Among a small percentage of recreational & commercial fishers; I've tried to use my observations from a lifetime of fishing in the Mid-Atlantic and 'citizen science' to help fisheries scientists & managers develop better strategies, both in restoration of long-lost populations/fishery production, but also in developing sensible quotas & regulations that truly aid in restoration. Tautog, for instance, close Nov 27 in MD until January 1st. Ask management, "Why?" and, with some small effort, they will show how 'overfishing' from 2001 to 2003 during wave 6 (Nov/Dec) mandated the closed period. This closure was needed to curtail "runaway" recreational effort. If you ask me, however, I would show, quite definitively, how a spike in MuRFSS catch estimates for shore effort (that is, tautog caught from shore only; not a broader increase in party/charter & private boat too) ..I have shown how estimates from shore-caught tog in Nov/Dec 2000/2001 created the APPEARANCE of a need for greater regulation. Cruising along at 3 or 4 thousand tautog landed from shore during the period--a number quite too high all by itself; in the year 2000, Maryland's Nov/Dec shore catch shot to over 17,000 individual fish. In 2001 it was sky-high again, but a tad lower at 13,000.. There is no shore-based tog fishery in the Chesapeake; no tog fishery at all really, save a few on more robust artificial reefs. Therefore, all of MD's shore tautog come from Ocean City - Maryland's sole seaside port. Unlike larger states where gauging catch & effort is surely more complex, for Ocean City's shore-based tautog fishery - all the players can be seen in a few minutes time by boat or car. A sudden spike in effort would be quite clear, even to non-participants. My old friend, Capt. Bob Gowar, was among coarse old timers that have given our waterfronts their soul. He said, "You gotta better chance of seeing Christ ride through this parking lot on a unicycle than catching 17,000 tautog from shore." Capt. Bob has passed now. Died in his tree stand of a heart attack after shooting two deer. Though sorely missed, there are worse ways to leave this world.. But MD's tog season is still closed in December. Closed because of those two spikes. I've opened up many, many estimates over the years. The only reason I've gone into such detail with this one is because those two estimates illustrate so much of our coastwide regulatory pattern these almost-20 past years. As in NY last summer, where skippers report 30 scup per sea bass, yet MRIP has NY catching 300K more pounds of sea bass than scup: Bad estimates are in control. I was out setting a pair of 110 pound Danforth anchors on inch & a quarter three-strand at Sue's Reef for an artificial reef deployment in December 2014. This reef site lays just 1.5 miles outside the Federal EEZ--the 3 mile line past which no striped bass may be taken. A Coast Guard cutter, a big one with 50 caliber machine guns hard-mounted on her bow, rolled up on us & inquired what we were fishing for..
Bad estimates create bad regulations. Regardless where the truth lies, there's no denying where the guns are. And almost all our regulation, certainly our worst recreational regulation, stems from estimates no one truly believes. Now, however, comes a time with a one-two punch. Flounder (fluke) stock estimates, (the 'how many fish are in the sea' number,) shows a downward trend. Where combined with bad catch estimates -- BIG TROUBLE. Fewer fish results in a lower quota. Repayment of fish (supposedly) taken over-quota from a previous period results in a lower quota. Like I said - Big Trouble.. There is little doubt this is an accurate population portrayal. There are fewer flounder than just a few years ago. Where there is incredible doubt is the CAUSE of this decline..
Wow. There all manner of theories. They may include one I heard at a MAFMC meeting in 2010 by a NC commercial representative: "At night the foreign boats come in and take all our fish." I think as wildly, but this from the sciences and being pressed quite hard, "It's ocean acidification." What? In just the last 5 years or so acidification's shot up? From near-record recruitment highs so recently, to quite normal-looking historical lows &, suddenly, there's an insidious environmental factor no one saw coming? From among many theories, someone's probably got it right, but I have no idea who. Pretty sure there's no fleet of foreign commercial trawlers laying just a couple hours steam offshore that can cause untold damage to our fisheries at night & slip back out in the morning mist. I also doubt the ocean's changed overly much in the last half-decade. I'm positive trawling for fluke off DelMarVa is the lowest it's ever been in my life. 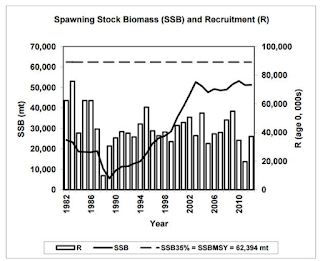 Here SSB = Spawning Stock Biomass. R = Recruitment, or, how many youngsters/juveniles survive to "recruit" to the fishery or spawning stock. Seems to me serious flounder regulation began in the early/mid 1990s. But you cannot look at that graph and see where regulation made a difference, any difference at all, in recruitment. 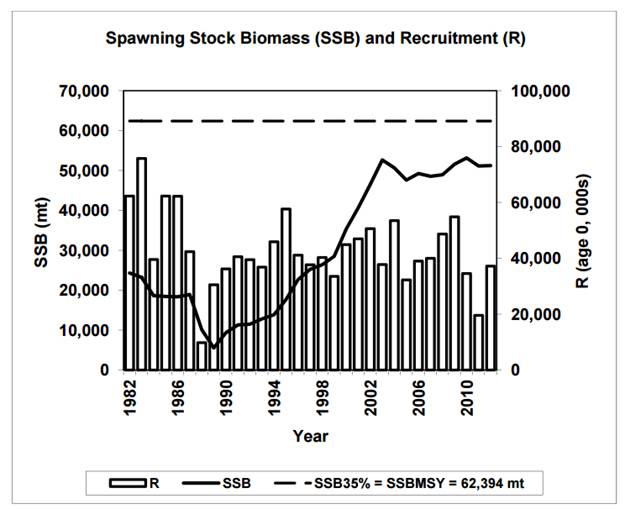 Even though the spawning stock rises far above its post-industrial fishing historical mean, there is no definitive uptick in production from far-greater spawn. Recruitment remains random & un-increased. It's really important if we're going to make any great leaps in fisheries improvements. I have no answers for fluke. I do not know how to increase production. I am seeing our fractionally small increases in artificial reef habitat used more and more by flounder. And I know fluke are indeed using these reefs in the time of year scientists say they spawn; a time when we see roe-sacks swell, and the bite typically diminish. I suppose the early (late 1940s to late 1970s) trawl-caused loss of vast live bottoms in the fluke fishery must have caused a decline in spawning & habitat fisheries production, but I have not considered fluke as deeply as tautog or sea bass. Well, yeah, but Depends on protection of their habitat? Will protecting the smoldering ruin of a once-stately stable/barn complex restore those horses? Even if protected with bow-mounted machine guns? I continue to assert: Our ability to restore fish & fisheries will eventually come to rest on our ability to create a habitat rebuilding plan from fishing's remembered past. When I go to Federal Fishery Council & Commission meetings, I see environmental & commercial interest staffers in the audience. Rarely do I see a salaried recreational representative. Where strength in negotiation comes solely from representation; that leaves us--we few who can be troubled with any of it--as part of a thin forward line. Though surely busy with life, soon we will have to write. Currently controlled by catch estimates almost no one actually believes, recreational fishers are the weak suffering what we must ..while decades of scientific opportunity to discover what might truly drive fisheries productions UP slips by. I tell all who will listen; spawning & habitat productions are where we must now focus. Catch restriction has, quite clearly, done all it can. Forever distracting is the battle for fair regulation from LSD-laced recreational catch estimates. Because I anticipate an epic battle for flounder up north this winter, there will again be no consideration of ways we might increase fluke production. Only statistics as Mark Twain saw them could ever "prove" anglers on one side of the Hudson or Long Island Sound, (or DE Bay for that matter,) MUST have a higher size limit, lower bag limit, & shorter season than anglers on the far shore. NOAA: Biology, ecology, & production be damned - We Have Statistics. Another decade & another.. If we do not soon learn how to increase "recruitment", and (think tautog or red snapper) recognize it, we will have squandered our generation's opportunity.